To assist with your wiki navigational activities, we have revamped the menu to become horizontal and follow you as you scroll down a page. This means that you will now be able to access the search and menu buttons from any point in any page. 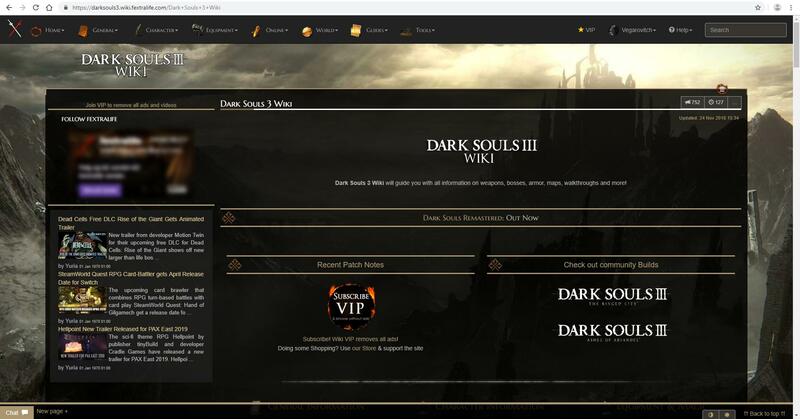 You can see it live in the Dark Souls Wiki, and throughout all our wikis later today. Please let me know if you find any bugs or issues, or if you have any other feedback! Is it possible to toggle off the recent news and the twitch stream on the left side of the screen? If not then that would be feature I would like to have. As a VIP, you should not be seeing the twitch stream. If you are, please message me so we can figure out why. The Recent News feed is not toggable at the moment. I can look into possibilities for it for a future update. The twitch window is still there for me, altough the stream is offline right now and the window is blurred when I am not hovering above it with my mouse.